OMG OMG OMG. Want want want. Let's face it. When it's minus anything outside and your phone rings, chirps or beeps, there's always that moment. The split second where you stop and calculate how long you have to take your hand out of your glove and use your phone before the frostbite sets in. Now, inevitably, if you are truly a smartphone addict (addict-schmaddict), you won't care anyway and you'll pull your hand out of that glove faster than you can say Android. But no more, friends! No! 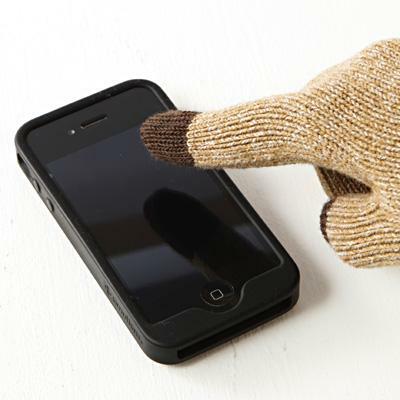 MUJI has threaded conductive material into their Touchscreen Gloves. Yes. Now you can be online and warm all at the same time! And the best part? They are actually affordable. Take a hint Santa (aka hubby) ;) Get them here.